See MycoGold in Action! What can MycoGold do for you? Soil isn't just something we stick a seed in. It's a biosphere complete with good guys and bad guys. As farmers, our job is to encourage the good guys and let them do their jobs. Mycorrhizal Fungi are the good guys and so are the other powerful biological organisms in MycoGold® that make it the next generation inoculant. MycoGold® not only brings back balance to farmer's soil, but also increases yield production in their crops. There is a natural habitat that exists beneath the surface in the root zone. Crops have a symbiotic relationship with the fungi. The fungi are responsible for getting nutrients and water to the plant and the plant in return supplies the fungi with carbohydrates. Mycorrhizal fungi strongly enhances the root system by creating masses of very thin strands called hyphae. These strands grow from within the root cells of the crop and spread out into the soil allowing for greater efficiency in uptake of nutrients and water. Modern agriculture practices have decimated the mycorrhizae in our soils and we need to reintroduce it through seed treatment. Mycorrhizal fungi is our featured ingredient but it's not the only piece to the puzzle. This is why we have developed MycoGold to be the complete package Biological Inoculant Arsenal. There is no other inoculant that has all the effective ingredients that MycoGold has. MycoGold® offers crop specific blends that are effective with improving production creating better soil environments, defending against disease, and infestations. We have experienced products that are front end beneficial and others that are back end performing. MycoGold is a complete package biological inoculant that starts working from germination all the way to harvest. With market price pressure, we know farmers are going to reduce input costs where they can, usually in their fertilizer program. MycoGold’s key biologicals work as bio fertilizers. Do not sacrifice yield, let the efficiencies of MycoGold do what they’re designed to. Give MycoGold a try and see the difference for yourself. Mycorrhizal Fungi is the only known fungal system, which is categorized as a bio-fertilizer. Its hyphae can extend much beyond a few meters away from the depletion zone and thus can acquire nutrients from a much wider soil area. ​The mycorrhizal fungus grows as a vast web of tiny filaments in plant roots and the surrounding soil. The fungal threads, called mycelia, explore a much larger area than do the plant roots. When the mycorrhizae encounter limited resources, such as water, phosphorus or micronutrients, they can pass them on to their associated plant. Mycorrhizal fungi seed inoculant can increase plants’ access to phosphorus, ammonium, potassium, calcium, iron, copper, manganese, zinc and nickel. 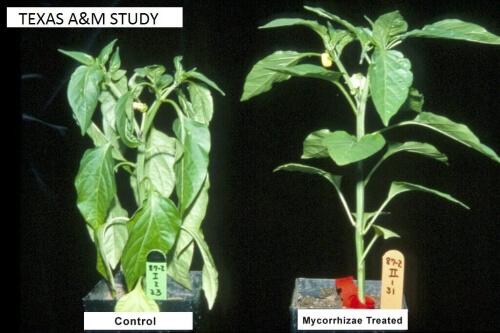 MycoGold® Mycorrhizal Fungi seed treatment can also help with drought resistance and heat tolerance. This is partly the result of mycorrhizae-induced hormonal changes in plants, which allow them to maintain a better water balance under drought conditions. Mycorrhizae allows for a 25% reduction of water in row crops which makes it a great drought insurance. Why haven’t I ever heard of this stuff? About 99% of farmers we talk to have never heard of mycorrhizal fungi inoculant, or seed treatment. We have been working with biological inputs for years and mycorrhizae in recent years . Actually, mycorrhizal fungi has been around for a while mainly for esteemed gardeners and cannabis growers. Until recent years, the fungi was unable to be mass produced which made it cost prohibitive for use on row crops. Now that MycoGold is available, more farmers will be able to improve soil biology, enhance their plants root system, and ultimately increasing their production. MycoGold is the next generation must use inoculant. By improving nutrient uptake and soil biology, MycoGold seed inoculant supports plant growth leading to yield increases. MycoGold’s key bacteria and fungi work as bio fertilizers that fix Nitrogen, unlock P, and create better root development and soil biology which allows better uptake of nutrients. Propagules start benefiting the plant in the early stages and are more effective than spores for row crops short growing season. Since MycoGold seed inoculant supports water uptake from the soil, they strengthen plants in drought periods. This is a high importance in times of increasingly extreme climate conditions. Through root colonization, researchers have determined better plant defense against disease. The Beauveria Bassiana fungi grows endophytically through the plant defending against various insect pests. We have been working with various biological seed treatments on our farms for over two decades. While most farmers’ interests have been directed to what’s occurring above the soil, they are missing what is necessary and important in the soil. Over the years we have experienced what works, what doesn’t, and what combination of active ingredients works the best for various crops. MycoGold was developed by farmers, for farmers. We know the challenges involved in farming and understand how important it is to get your input costs where they need to be while providing maximum production in return.It is our goal to educate farmers of the benefits of MycoGold and provide them with the best performing inoculant available. Give MycoGold a try on your farm and realize it’s really worth Gold to your crops.